Elf-Magic tm Elves are like no other! These elfin friends come complete with a snowflake embroidered on their hearts, showing them as authentic North Pole helpers. They usually arrive in the child's home on Thanksgiving night, but sometimes come a little later if they are not quite finished with their toy-making duties. 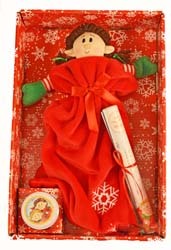 These charming elfin friends come complete with a name, letter to your child, and magic snow flakes. Just sprinkle them over the elf a bed-time so the magic can happen. Elf-Magic elves never report a child's short-comings to Santa -- but come for a special holiday to charm and love your child in a special way for the holidays. Santa takes the elves back on Christmas Eve. Hint: the box the doll arrives in can be saved and made into a "bed" if you add a pillow and blanket. Doll Height: 10 inches. PA Customers will be charged an additional 6% sales tax rate which may not be calculated in your shopping cart.